We were lazy when we finished the backyard and didn’t dig up the fill sand in the part of the yard closest to the house. Instead, that area got a thin veneer of pebbles. 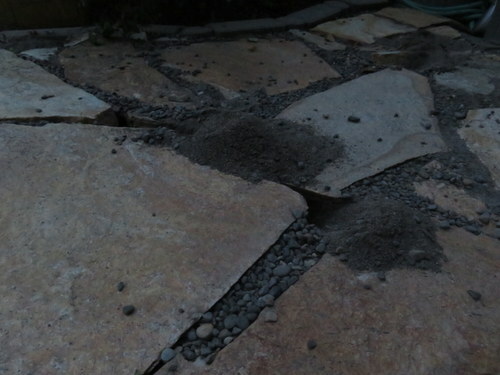 It wasn’t enough to deter the squirrels, who thought the spaces between the flagstone were perfect for burying walnuts. The squirrel mafia continues to be aggressive around here – especially as they prepare for winter. They keep getting into our meal delivery service boxes! Creeps!